Thanksgiving is a time when we traditional give thanks for the things we have in our lives. Almost everyone says family, health and such. This year it really is family and health for my family. My husband got very sick after surgery in early October. There have been many times during this time I wasn’t sure he was going to make it. This past week things have really turned around and he is getting stronger and better each and every day. Although he will not be home for a traditional Thanksgiving and am beyond thankful that he is here and that we will be able to be together. I have had many family and friends who have been so helpful throughout this time and my son’s teacher has been great. He is young so he can’t go to visit his dad in ICU. As most teachers can attest when something is going on at home it almost always has an affect on the child at school. My son’s teacher has been extra patient with him, loving on him and making sure he speaks with the counselor often. I am humbled by how much they have stepped in. 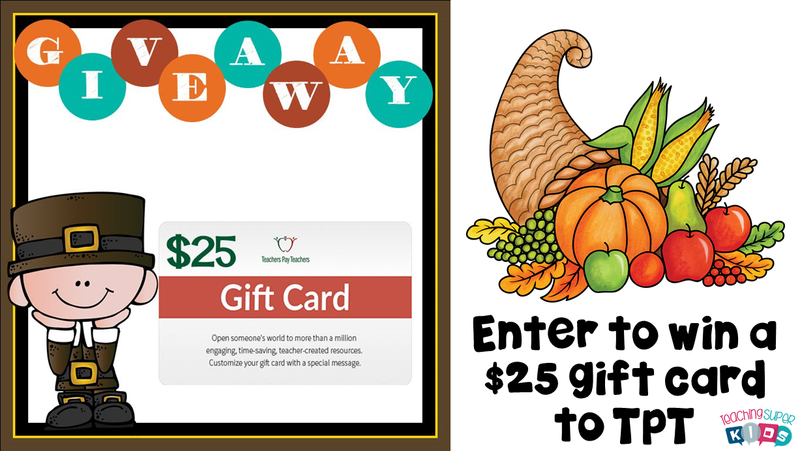 I am joining with Kelly Malloy with An Apple for the Teacher for a giveaway as we reflect on Thanksgiving! Enter to win below and thank you for all you do each and every day. Despite what it may look like you have the ability to make all the difference in someone’s life daily! Co-hosts: An Apple for the Teacher, Alina V Design, Claudia’s Classroom, Teaching Ideas For Those Who Love Teaching, Kathryn Watts, and Teaching Superkids.